RIYADH: US President Barack Obama said Thursday that Washington and Gulf Arab states were united against the Islamic State group as he sought to overcome strains on Iran to boost efforts against the extremists. In Riyadh for talks hosted by Tehran’s arch-rival Saudi Arabia, Obama said the United States still has “serious concerns” about Iran, but insisted no country has an interest in conflict with the Shia power. 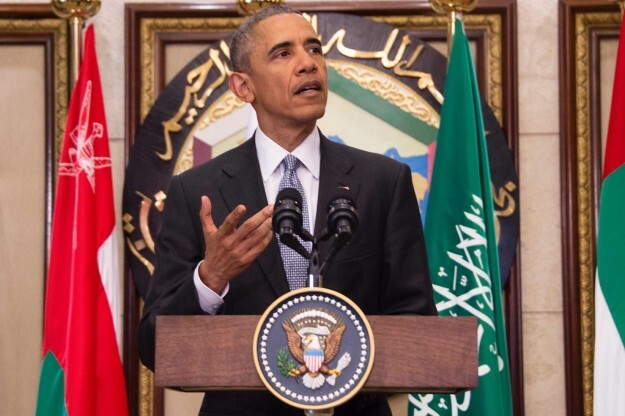 Obama, on likely his final presidential visit to America’s historic Gulf allies, was in Riyadh seeking to reduce tensions with the Sunni Arab states rooted in US overtures to their regional rival Tehran. With the IS militants suffering a series of recent setbacks in areas under their control in Syria and Iraq, Washington is seeking more help from the oil-rich Gulf monarchies to keep up the pressure. Speaking at the close of the summit of the six-nation Gulf Cooperation Council (GCC), Obama played down any divisions and vowed continued cooperation in the battle against the extremists. “We remain united in our fight to destroy (IS),” he said. “Given the ongoing threats in the region, the United States will continue to increase our security cooperation with our GCC partners including helping them improve their own capacity to defend themselves,” Obama said. Seated beside Saudi King Salman inside a Riyadh royal palace, Obama said concerns remained about Iran’s “destabilising activities” despite its landmark nuclear agreement with world powers and the lifting of sanctions. “Even with the nuclear deal we recognise collectively that we continue to have serious concerns about Iranian behaviour,” Obama said. He warned, however, of the risk of confrontation with Tehran. “None of our nations have an interest in conflict with Iran,” Obama said. Iran’s emergence from international isolation following the nuclear deal has worried the Gulf monarchies, who fear Tehran will be emboldened to seek a still bigger regional role. Gulf Arab states and Iran back opposing sides in a range of Middle East conflicts, including in Syria and Yemen. Saudi Arabia and other Gulf states belong to the US-led coalition that has been carrying out air strikes against IS in Syria and Iraq since mid-2014. But US officials have urged them do to more, especially to support Baghdad, which is battling political chaos and an economic crisis as well as the extremists. Ben Rhodes, a close adviser to Obama, said there were “political steps that can be taken,” as Iraq would need assistance to hold on to and rebuild areas reclaimed from IS. Obama said a cessation of hostilities in Syria is “obviously under tremendous strain” as fighting has intensified in some areas despite efforts to hold peace talks in Geneva.